Regional publisher Newsquest has bought one of the UK’s biggest remaining independent newspaper groups, adding one daily and a number of weeklies to its portfolio. 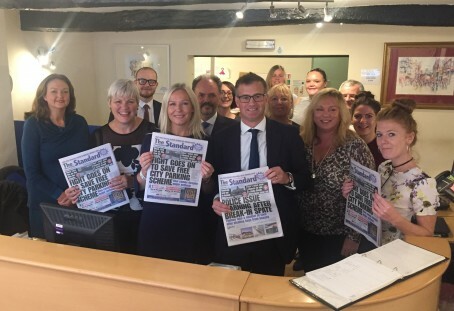 Newsquest has today announced the purchase of NWN Media, which publishes papers across North and Mid Wales, Cheshire and Shropshire. The NWN board unanimously accepted an offer from Newsquest for the company, although the purchase price has not been revealed. It is the second significant expansion in Newsquest’s portfolio this year following the takeover of the independent Isle of Wight County Press in July. Newsquest chief executive Henry Faure Walker, centre, pictured with NWN staff at their Chester office today. NWN is based in Mold, near Wrexham, and currently employs around 300 people across North Wales and Cheshire. Its titles include Wrexham and Flintshire daily The Leader, as well as weekly papers including the Chester Standard, South Wirral Standard, Oswestry & Border Counties Advertizer, Rhyl Journal, Powys County Times, Denbighshire Free Press, Whitchurch Herald, North Wales Pioneer and North Wales Chronicle. NWN was nearly sold to veteran newspaper entrepreneur Sir Ray Tindle in 2013, but the company’s board was split over the proposed deal and the issue eventually had to be settled in the High Court. As well as newspaper publishing, NWN also operates an extensive contract printing operation. Newsquest chief executive Henry Faure Walker, pictured above left, said: “NWN Media comprises a stable of really strong local media brands that command great trust and unrivalled audiences in their communities. We’re looking forward to working with the NWN staff as they continue to transition their business to a successful and more sustainable future. David Faulkner, managing director of NWN Media said: “This is good news indeed and I strongly believe it is the best way forward for our group of titles. Our brands continue to command significant loyalty in our market places and the added resource scale and investment potential that Newsquest will bring will be invaluable to our continuing profitability. NWN was previously owned by the Thomas family but when its former owner Eric Thomas died his shares were divided between his three daughters – Nonna Woodward, Susan Bourne and Erica Moss. Ms Woodward, who was then the deputy chairman of the company, and chairman Russell Whitehair were keen for the deal with Sir Ray to go through – but the Bourne and Moss families objected. Eventually the issue went to the High Court where Mr Justice Henderson ruled that the proposed sale of the shares could not go ahead. Ms Woodward and Mr Whitehair subsequently left the board. Thought NWN owned the Hereford & Shrewsbury Admag’s as well ? Not for much longer, it doesn’t. This is crazy. Did no-one learn from the JP debacle. Small and niche is the way forward. Why milk your weeklies to feed your big daily hitters. That’s what JP has done and gotten themselves in a muddle. Unfortunately, like many industries, newspapers have been taken over by people who don’t have scoobie doo. It pains me everyday to see the mess that these FOOLS have ctrated. They may as well let me perform brain sugery.. I call it ‘digital grabbing’..Greedy FOLS thinking they can kill off print and make a fortune in digital publishing with no print costs, mimimal journalism and freelance photography. I’s been the best part of 10 years now and the fools still can’t properly monetise it..give up now. Digital dosent work for everything.!!! Medium sized newspaper businesses are really feeling the squeeze now. Big media businesses enjoy the efficiencies that scale and centralisation provide, whilst small businesses provide enough love and focus without big overheads. In the middle of these two isn’t easy. More medium sized independent businesses will certainly sell or close over the coming months and years. Medium-sized businesses don’t have to feel the squeeze. They can do fine, if the will is there – but that’s the crux. Medium sized businesses are usually the fief of second- or third-generation families with a few extra local directors and rather than carry on the good work of their ancestors they run for the money when it’s offered by the big boys. Note how everyone management in this story is saying how good this is for NWN, when NQ’s record proves that it isn’t; what they mean is it’s good for them, personally.